Cheesecake is one of my favorite special treats. I never make it just for my family, and I rarely order it in a restaurant, though I do have fond memories of trying all sorts of insane, candy bar-laden flavors when The Cheesecake Factory first opened years ago. i love the pumpkin cheesecake we have for Thanksgiving, but it's not the same thing as plain, creamy, slightly tangy-sweet cheesecake. When I started catering, I knew cheesecake bites would be a hit for parties. I happened on this recipe, and it's delicious. Just a tiny piece is enough to satisfy because cheesecake is so rich. The creamy texture is a great complement to other bite-sized desserts. And you can top the cute little bites with whatever seasonal accompaniments you like. I've done it with blueberries and also with tiny slices of candied lemon peel. The next thing I'd like to try is a two-layer (dual-flavored) cheesecake, and/or some kind of chocolate or caramel drizzle. Unless you're planning to bake this, I discourage reading the recipe too carefully, or you'll feel the need to hit the gym in anticipation. There are FIVE eight-ounce blocks of cream cheese in this recipe. The saving grace is that it makes a 9x13 pan; even if you need to trim off the edges, you can still easily get 80 or more bites from one pan. Most cheesecake recipes are very fussy and require baking in a water bath (you place the pan inside a larger pan filled halfway with water). This one just pops straight into the oven, though I would recommend baking when there are no junior family members running around, jumping, and slamming doors. Even if it does crack - which I haven't experienced - it's not a problem when you cut it into tiny pieces. So give it a try, and don't be intimidated! First, line a 9x13" pan with parchment, leaving an overhang on each of the short ends. This way, you'll be able to remove the cheesecake to cut it. To make the crust, pulse the cookies in a food processor until they become crumbs. Add the 1 1/2 tablespoons of sugar and cinnamon and pulse to combine. Press the crumb mixture into the bottom of the pan. (It seems really weird to me that it doesn't have butter, but I promise, it tastes great and it holds together remarkably well.) Chill it while you prepare the filling. Preheat the oven to 475F. Use the mixer to beat the cream cheese, 1 3/4 cups sugar, and flour. Add the eggs and yolks, one at a time, beating after each addition. Stir in the milk. Pour mixture over the crust. Bake for 8 minutes at 475F. Lower the heat to 200F and bake for 50 minutes. Turn off the oven, but don't open the door, and leave it in the oven for an additional 50 minutes. It should be very pale with maybe just a little color on the edges, and should seem nearly set (not too wobbly). Remove from the oven, cool completely, and then refrigerate overnight. Please note that cheesecake - or at least this recipe - needs some time for the flavors to meld. It tastes much better the next day after it has aged a bit. To serve: Use a thin, sharp knife to loosen the cheesecake from the edges of the pan, and carefully lift it out and place it on a cutting board. It should hold up okay, but if you're concerned, just leave it in the pan and remove a small section at a time. If the edges got a lot of color during baking, or if they seem dry, trim a bit off the edges. 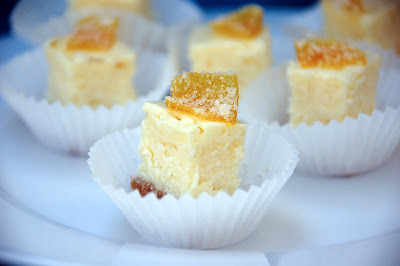 Then cut the cheesecake in strips, and then in tiny squares. I usually aim for about one-inch squares. Wipe the knife clean after each cut to ensure the cleanest, neatest pieces. If you want to drizzle them with caramel or chocolate, I would suggest cutting all the pieces first, then drizzling the whole batch, and then separating them to serve. 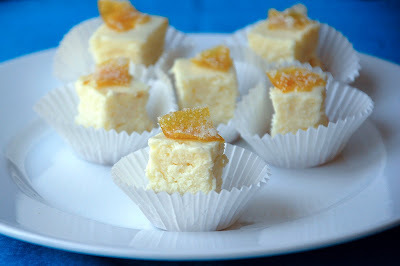 Alternatively, to top them with fruit or candied lemon peel, place each square in a mini baking cup. When I use lemon peel, I press it slightly into the top of the cheesecake (so it won't fall off). Similarly, when I use berries, I place a dab of glaze on the bottom of the berry like glue. To make the glaze, just mix a tiny bit of water or milk with some powdered sugar. Store them in the fridge. They last a ridiculously long time - probably up to a week, if you don't gobble them all up first. Enjoy! Excellent - will add this to my cheesecake arsenal. Love that it bakes in a 9x13 cake pan. ...even though she lists flour in the ingredient list BUT NOT THE DIRECTIONS....causing me to call Bankers Assistance in LA two days before T'Day!! So glad that you have enjoyed the recipe! We made it over the holidays in a traditional round springform and it was definitely creamier than when I make it in the 9x13 for bite-size pieces. The only downside is that it is much more likely to crack in the round version.